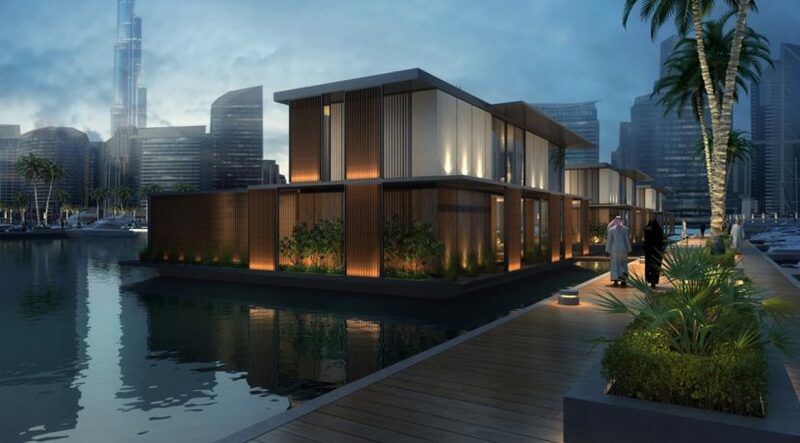 Dubai Properties has dropped anchor for what are to be the city’s first fully-fledged “water homes”. Or — to be more precise — laid the foundation for them. Located off Business Bay and smack on the Dubai Water Canal, the limited collection of super-premium homes could go on sale later in the year. Instead of concrete piling and thick, ungainly columns — as in offshore oil rigs — to support the properties, the master-developer is using a mooring technology that elongates and contracts with the tides. The technology — known as “Seaflex” and sourced from a Dutch firm — is rated as being far more environmentally friendly and also scores in terms of the aesthetics. “Not a single unit of the “Marina Homes” has been put on sale, but it forms part of our plans for 2017,” said Masoud Al Awar, Chief Officer — Commercial at Dubai Properties. “But the designs are now done and we are considering exhibiting these to potential customers. Al Awar declined to go into price specifics, though it could be these are still being finalised. “Their uniqueness will decide the prices,” he added. 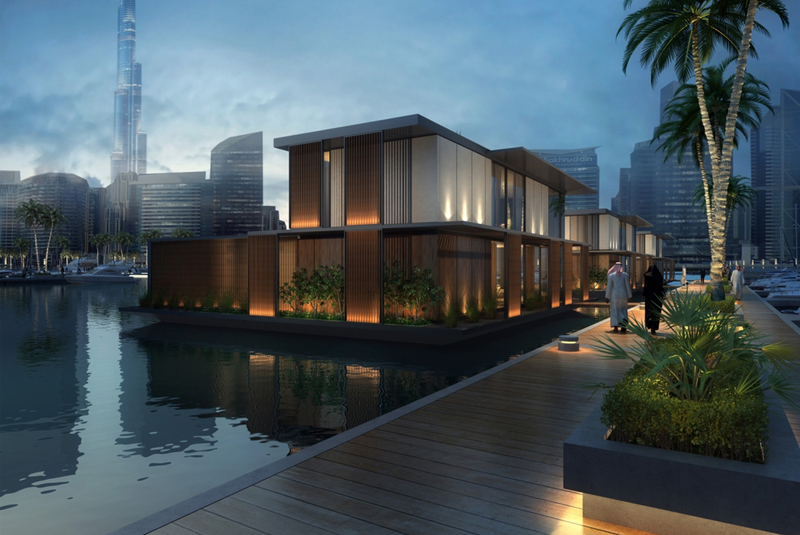 For Dubai Properties, the water homes provide the ultimate value add for the wider Business Bay development. The “Marasi” marina stretch including the Canal and the water homes will form one boundary for the entire development, while on the other it has Shaikh Zayed Road. The benefits of having the Canal are yet to be fully reflected in overall Business Bay apartment prices … that could well change in a market upturn. This is not the only waterside master-developments in the Dubai Properties portfolio. There is Culture Village with its Palazzo Versace and D1 skyscraper, both built and owned by a private developer. But Dubai Properties on its own has two fairly sizeable residential clusters in the form of Dubai Wharf and Manazel Al Khor within Culture Village. The handover of units at Dubai Wharf is already well advanced and to be followed by those at Manazel Al Khor. The entire development could soon have more than 2,000 people living and working there (at the retail units). Currently, apartments at Dubai Wharf are on between Dh1,400-Dh1,700 a square foot and in Manazel Al Khor are around Dh1,700. On whether Dubai Properties would launch another cluster at Culture Village, Al Awar said: “This is part of the plan, but must be revealed at the right time. What I will say is that DP has been fulfilling the requirements of the market. But there is mega-sized competition down the Creek, in the form of Dubai Creek Harbour, where average prices have been in the Dh1,200 a square foot range. The handovers at Dubai Wharf, in particular, created a sense of fulfilment at Dubai Properties. “It was the first project Dubai Properties delivered before the target date,” said Al Awar. “This requires putting in the infrastructure access and all those aspects related to it. This was done at the end of last year. With the water homes project now off the blocks, more milestones beckon for the developer. Dubai Properties sure has the complete portfolio — in Dubailand and Culture Village, it has two massive land banks in the city. And its upscale 1 JBR high-rise project will have the developer reach for the skies. Now, with the Marasi water homes, it is stretching the boundaries of where to go.